Last Friday, President Trump signed a Presidential Proclamation banning entry into the U.S. between designated ports of entry, denying people their full right to seek asylum in the United States along the southern border. The Department of Justice and Department of Homeland Security have issued a new joint rule ensuring that migrants subject to the Proclamation are ineligible for asylum in the U.S. It is not a crime to seek asylum at a border, port of entry, or other location within the U.S. The right to petition for asylum is firmly established in both the U.S. Immigration and Nationality Act and international law as a critical means of protection. JRS/USA continues to oppose any effort to limit entry into the U.S. and requests for asylum based on place of origin, religion, or vulnerability. As an organization working with asylum seekers, refugees, and others who have been forcibly displaced in over 50 countries around the world, JRS witnesses first-hand the risks that individuals and families take as they flee their homes in search of peace. 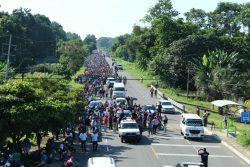 JRS Mexico is currently responding to the needs of the migrant caravan by providing legal services, emergency food assistance and psychosocial support for those who have suffered trauma. To protect the rights of asylum seekers and continue the American tradition of providing due process to all, it is crucial that we take action. Please take a moment today to send a letter to the Administration and your policymakers urging them to oppose this Presidential Proclamation and advocate for the rights of asylum seekers and refugees.